Conflict is shaping up between Italy and Brussels over the budget and fears of recession. Who should be worried? We spoke with Carlo Cottarelli, Italy’s former interim prime minister and former head of the IMF. Sophie Shevardnadze: Carlo Cottarelli, Italy’s former interim Prime Minister and former head of the International Monetary Fund, welcome to the show, it’s really great to have you with us. 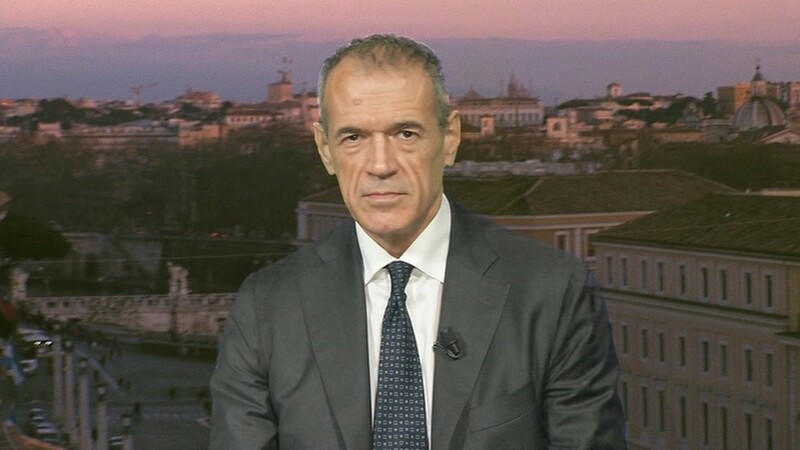 SS: Mr. Cottarelli, the International Monetary Fund, which you used to run, says Italy’s economic growth in 2019 is going to be slower than previously expected. Should Italy be worried about a collapse of the scale, let’s say, of Greece? CC: The government has a target for growth of 1% of GDP in real terms. The IMF says 0.6% of GDP. I think a growth of 0.6% of GDP is much more realistic. I think that achieving a growth rate of 1% starting where we are would require a very strong acceleration of growth in the second half of 2019. There is almost no way there could be such a large acceleration. Even achieving a growth rate of 0.6% in 2019 would require an acceleration with respect to what we have seen in the third quarter of last year. SS: OK, but the point is the country is heavily indebted, Italy’s debt right now is 1.8 trillion euros. How will the country manage to dig itself out of that? CC: It is definitely a big issue and it becomes a bigger issue if there is no growth. I mean, the problem was easier to solve in the last few years when the growth was about 1–1.5%. If starting in 2016 we had kept public spending constant in real terms without any cuts, with a growth rate of 1–1.5% revenues would have increased and we would have achieved in 2019 a balanced budget. If growth now stalls – and actually there is a recession – things are going to become very difficult for Italy. What we need to be afraid of is an increase in the public debt -to-GDP ratio. The public debt-to-GDP ratio is more or less stable, and with a growth rate of 0.6% we’ll still be more or less stable. But if we get into a recession and the public debt-to-GDP ratio will start rising then that is going to cause problems because this could trigger a confidence crisis. SS: In mid-December, Brussels eventually approved Italy’s budget after months of bickering, saying Rome’s spending plans were too extravagant. Now Italy is being forced to shave billions off its budget. Italy’s leadership say the deal doesn’t betray the Italian people and is good for both sides. Is that so, or is Rome just trying to save face? CC: The government is delivering something, there’s no doubt about this, it’s delivering less than what they had promised, but what they promised during the electoral campaign was clearly impossible to do, there were spending promises of 110 billion over the next five years, so there is an increase in spending. For this year they found temporary spending cuts, so this year the deficit does not increase very much, yet they are delivering this minimum guaranteed income – so called citizen’s income – and they are delivering a reform of the pension system which will allow people to retire earlier. So, for this year they found some sources of financing without a major increase in the public deficit, but for 2020 it’s a mystery. The parliament approved an increase in VAT for next year to a level of 25% which would actually rise to 26.5% in 2021. But the government has already said this is not going to happen, so it’s not clear how the financing will be found for next year. If they don’t find the financing the deficit will rise to over 3–3.5% of the GDP. SS: That’s the big question because the social spending is very big on Italy’s government’s behalf. Italy’s President has signed a decree that would bring in basic income for the poor and decrease the retirement age. And that’s all great, but are these measures what the heavily indebted Italy really needs right now? And how would that mesh with Brussel’s austerity measures? CC: If Italy had a low public debt to GDP ratio I think it could afford taking some risks on the spending side – particularly in a situation in which the economy slows down. Keynesian policies are fine, stimulus policies are fine if a country has a low public debt-to-GDP ratio. When the public debt-to-GDP ratio is so high, markets may get nervous, and indeed they did get nervous when the government was targeting a deficit of 2.4% of GDP premised on a growth rate of 1.5% which was unachievable. The government, however, has scaled down their spending activity for this year, so the deficit now targeted to be 2% with a lower growth rate. But there are still risks even in achieving these targets. If the targets are not achieved and the deficit is larger, especially in a context in which the economy is not growing or is shrinking, then there could be serious problems. I don’t foresee this happening. I think that hopefully the slowdown of economic activity in Europe is temporary, so Italy will gradually recover, but if we get into a recession it’s a major problem for Italy and the rest of Europe. SS: Austerity measures proposed by Brussels, - that’s what they keep doing for the past 10 years, - it never worked for any single economy in the EU. Why would it work for Italy? CC: It doesn’t seem to me that Brussels has been proposing austerity measures for the last few years. Brussels has allowed Italy to maintain an unchanged, actually, declining primary surplus – the balance net of interests payment, the deficit has been declining very slowly, so Brussels has given a lot of room and time for Italy to fix their fiscal account. Italy has not done so. As I said, if Italy had kept without any austerity, without any cuts in public spending, if Italy had maintained spending constant in real terms for the last few years, so without any cuts and any austerity in the situation in which Italy was growing, now we would have a balanced budget. We have lost time, and now we get into a situation that is very difficult to tackle, because if the economy slows down, expansionary measures will be needed, but expansionary measures will make markets nervous. So, if you’re asking me “What is the solution”, I don’t know at this point what the solution is, unfortunately. We may be getting into a very difficult solution, very tough austerity measures in a crisis like in 2011 may be necessary, they don’t help the economy to grow at that point, but there is no alternative at that point. If the government cannot finance itself, if interests are too high, there is no alternative, but certainly it doesn’t help the economy at the point, but the alternative, however, will be even worse. And then we may be getting the same situation where an easy solution is not easy to find. SS: I want to talk about the refugee crisis. Data now suggests a declining number of refugees are coming into Europe, for the first time in a very long time. Italy has deported more migrants than it has let in – at least, since the start of 2019. Is this the new government’s doing or a coincidence with the migrant influx slowing down anyway? CC: No, it’s not a coincidence, I think there was already a strong decline. In the last part of what the previous government did there was already an 80% decline on the influx. Now the decline has become 0% because this government has taken a tough stance towards the migrants. If you ask me as a citizen, I think that this is becoming even a bit too much because now the discussion is about these 47 people. Allowing 47 people to come in wouldn’t make obviously much of a difference. It was a different story when every year in Italy there was almost 200,000 people coming in as if there were no borders. Now the situation is under control. Fighting now a battle of principle about 47 people – I don’t think, it’s very useful. Unfortunately, most of the attention, most of the policy discussions in Italy in the last few days have been focused once again on these 47 people. Italy’s problems are different now. We have a problem with public accounts, with growth, now everything is focused on this issue of immigration, which at the present is not the key issue for Italy. It was in the past but not at the moment. SS: Mister Cottarelli, Italy and Malta have been at loggerheads over hosting refugees who’ve been rescued at sea by NGOs like Sea Watch. Italy’s coalition government were divided - Salvini was adamantly against any new arrivals, but the 5-Star Movement’s Di Maio was open to allowing some in. Is this a sign of a larger rift between the two parties? CC: There are clearly differences in the political views of these two parties on this issue of immigration as well as on other issues. There is one element that keeps them together, one glue, and that’s in a way this nationalistic feeling and feeling of opposition towards Brussels and the European Union, as if the European Union that we have known in the last few years, as they say – they don’t say necessarily “Italy should not be in the European Union”, they say “We don’t want this kind of things, we don’t want the euro area as it has been”. This is a very important thing that keeps these two parties together. Another kind of glue is this feeling against the elite that has governed Italy before the period when they were in power. At the same time there are clearly differences between these two parties, and the question is, after the European elections, will the glue that keeps them together still be sufficiently strong? I myself have doubts about this. We don’t know, it all depends a bit on what is in Mr. Salvini’s head, and, honestly, I don’t know. SS: The so-called “Salvini law” which abolishes humanitarian protection status for migrants and makes it easier to strip migrants of their right to remain, has already ignited protest marches. Several Italian mayors have refused to obey the new legislation. With all the fallout, do you think the law is at least effective at dealing with the refugee issue? CC: The issue of the refugees as we discussed earlier has been dealt with the sense that the people that are coming in are very few. I think that this decree is tightening a bit the condition in respect to the people who already in, and there’s definitely some problems in terms of tension that this may be creating. But again, I see this mostly as a political issue with limited consequences for economic development, for example. Yet it is attracting a lot of attention. If you ask, there are different surveys of what the population believes. There was one, for example. It showed that the majority of the population believes that it would be a mistake, for example, to send back these 47 people to Libya. So, there are different views on this. But definitely in my view all these issues are attracting far too much attention. The main problem now in Italy is not immigration, which has stopped, and it was right to stop it, but it’s not the main issue anymore. And yet perhaps even those who are already here are declining anyway. The government is saving quite a lot of money this year, because the number of people that are non-resident, that are in Italy in these centres, is declining, and yet this is attracting far too much attention. SS: It is. Do you think Salvini now will deport the tens of thousands who claimed their refugee status on humanitarian grounds before? Do you think those people are also going to be deported? CC: That is going to be difficult, I don’t know. I think the statement that has been made in the past went in that direction, but I don’t know whether they would be able to deliver. As the experience of the United States has shown it’s not so easy to deport a large number of people. SS: The sociological data shows that if Italy were to vote on remaining in the European Union, less than a half of all Italians would support staying in. The percentage is actually lower than in the UK, which is actually leaving. And the two major parties that form the current government are eurosceptics. Can we expect that Italy will also leave – inspired by the United Kingdom? Or will Italy drop the idea - learning from the Brexit mess? CC: There was a survey a few months ago showing that only 45% of people wanted to stay in the European Union, this is how the survey was reported. The reports however did not say that only 23% wanted to leave, so there was simply a very large number of people who either had not answered the question at all or did not have a very firm view. I think that if there were a referendum now… And the other surprising thing of that survey is that the majority of people actually wanted to continue to use the euro which is sort of inconsistent with the fact that the majority did not want to… well, I cannot say the majority didn’t want to stay – only 44% wanted to stay. It was still a relative majority because those who wanted to leave were only 23%. I believe that the majority of people definitely in Italy want to stay in the euro area, not only the European Union. The question is whether they want to do the things that will be necessary for example in terms of public accounts, whether they want to do the things that will be consistent with staying in the euro area. The problem, however, to tell you the truth, is not what has happened in the last few years, but the difficulty that Italy suffered in the first 10 years after entering the euro area. Now we are sort of catching up but we are still far away from where we should be. SS: During his recent visit to Warsaw, Salvini said that the European spring is coming to an end, it’s going to end the German-French axis in Europe, and that Italy and Poland are expected to be the vanguard of this change. That’s noble, but German-French ties in Europe aren’t based totally on German and French desires, but rather on the strength of their economies - can Italy and Poland really pull their weight compared to the powerhouses of Europe? CC: It seems to me difficult that Italy and Poland and even other smaller countries can really make a major difference in terms of moving Europe in a certain direction. They can however impede movement that for example France and Germany would like to have in another direction. So, I see this kind of coalition as something that can stop change rather than promoting change in the direction, for example, that Salvini would like to get. All this, however, is premised on the bigger question mark – how well the nationalistic movements will do in the European elections? Honestly, from what I read in the newspapers and in the surveys, it seems to me that it’s difficult to believe that there would be a European parliament dominated by the nationalistic forces, but they can strengthen themselves quite a lot with respect to the past. And in this way, they can prevent the kind of change France and Germany would like to have. SS: Do you feel that this sentiment that brought about the current leaders in Poland, Austria, Hungary - this eurosceptic wave - will it really be enough, like Salvini says, to change Europe? Is everyone in Europe dreaming about a government like Italy’s or Poland’s? CC: I think that, as I said, this kind of movements and this anti-European forces or nationalistic forces – I think they can stop the change, but I don’t think they can fundamentally change the nature of the European Union unless they do extremely well in the European elections. One thing, however, that what is happening could yield, is a two- or three-speed Europe, so it’s possible that at one point France, Germany and a few other countries decide to move ahead without taking together Italy, for example, and they bring to a different level their kind of integration. That’s possible. So, Italy and Poland will not prevent change, but will not be part of the change – that’s another scenario. SS: Mr. Salvini and Mr. Di Maio have been dragging French officials into a war of words, invoking a grim echo of Europe’s colonial past. Do you think Emmanuel Macron’s current weak position at home, undermined by the Yellow Vests protests, could play into Salvini’s hands? CC: Certainly, Salvini and Di Maio hope that Macron’s weakness will be their strength, so these attacks on France I don’t think are particularly useful also because the last one, the most recent one about this “France and Africa and the role of the CFA franc” was not understood by Italian people first of all and did not have any substantive basis. I think, the Five Star Movement perhaps did not even understand the issue that was at stake. It was a blunt mistake to attack France on this. It’s a different story when Salvini or Di Maio see France in trouble because of the “gilets jaunes”, and that can actually help Salvini. And, in a way, this has already helped Salvini and Di Maio because perhaps Brussels’ attitude, the attitude of the commission towards Italy when there was an issue of discussing the deficit for this year and next year, perhaps it was already mild because of what was happening in France and because of the fact, because of Macron’s decision to raise the deficit, to spend more and raise the deficit for France in 2019. So, we already see some consequences of the trouble that Macron is having in his own country. CC: That was actually more the Five Star Movement. SS: Yeah, but I’ve heard Salvini actually said that France doesn’t deserve a president who is against his nation, he says he supports the people and he doesn’t like Macron because he’s against his nation. So, the question is, with the budgetary defeat in Italy, does Italy risk running into its own Yellow Vest problem? CC:The yellow jackets, the “gilets jaunes” in a way are already in power in Italy, so I don’t think there will be any demonstrations in Italy from that point of view because I met recently some high level representative of the Five Star Movement, and they told me “If it were not for us, we would have people in the streets, we would have the “gilets jaunes” in the street in Italy” and my answer was “Well, they are in the government, we have the “gilets jaunes” in the government, so it doesn’t make much of a difference”. SS: Alright, thank you very much for this interview and for an insight on whatever is going on in your beautiful country. Good luck with everything! We were talking to Carlo Cottarelli, Italy’s former interim Prime Minister and former head of the International Monetary Fund, discussing fears of yet another Eurozone crisis and Italy’s troubled relations with the EU.